As winter comes full swing, so does the dry skin. Lately I have been experiencing lots of dry, irritated spots around my face and especially my eyes. As you can imagine dry, flaky skin is not cute, especially under makeup. I have not been wearing much makeup if any at all because of this. This is why I haven't posted any makeup related post up. Typically when this occurs I reach for my handy dandy NARS masque and all though this has helped hydrate temporarily, it has not been a long term problem solver. So I'm defiantly in the market for some new skincare and I thought I'd share what I've had my eyes on. REN Ever Calm Global Protection Day Cream: This is said to be for sensitive skin, which I defiantly have at the moment. Kiehl's Ultra Facial Cream Intense Hydration: I have always heard how great Kiehl's products are for hydrating and this just sound like it would really hydrate without being overly oily. 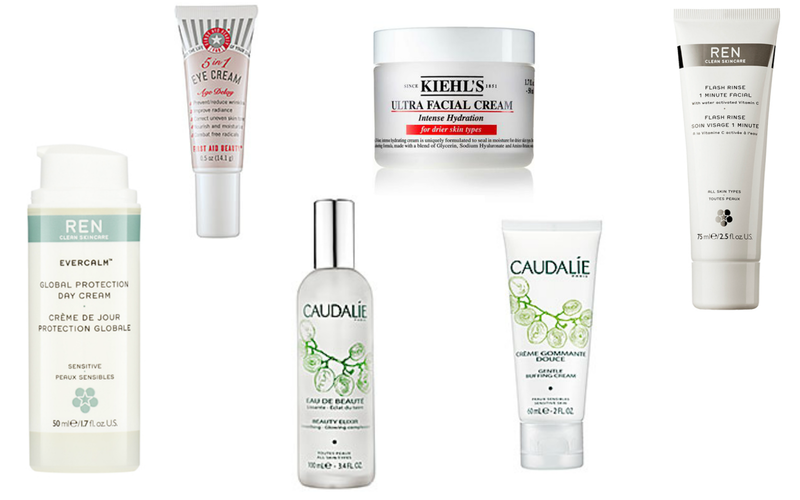 Caudalie Gentle Buffing Cream: This sounds amazing for dry, flaky skin. It will get the dead skin off without being too hard. Caudalie Beauty Elixir: I've heard only put great things about this. Its apparently soothing and hydrating, win win. REN Flash Rinse 1 Minute Facial: This is absolutely intriguing to me, but I'm still on the fence about. Have you all tried this? I have a history of eczema and I'm starting to think its back, but can you really have eczema on your face? If you happen to know, please let me know in the comments below, I can only Google so much before I become the next bubble girl.